The City parks are using 20% less water than before the “Big Drought” and we can see it in stressed turf and trees. This year’s water costs are budgeted at $6 Million with another major rate increase is coming. Without enough water, weeds take over the turf creating tripping hazards, ground squirrels flourish, and trees weaken and die. The city’s public face looks ragged. PRNS needs money for water. There are solutions that use less water–smart irrigation controllers that respond to the weather; updated irrigation systems, improved turf with drought tolerant varieties, and bringing recycled water service to more parks. These improvements take money. And that’s where you can make a difference. Ask that the PRNS water budget reflect actual costs that include the upcoming rate increases, and automatically increment each year to reflect rate increases. Tell them it is unacceptable to force PRNS to get money for water by delaying the hiring of maintenance personnel and the purchase of replacement equipment such as mowers. Water is critical to the infrastructure of parks–the trees, the playability of turf, and its aesthetic value. Tell them a water story from your park. Ask that the proposed November 2018 bond measure and the annual Capital Budget include money to install SMART irrigation controllers, repair and replace the irrigation systems, and replace and rehabilitate turf with drought-tolerant varieties in order to save the most water and money. Give examples of bad irrigation and drought impacts from your own park experience. Mention the dead trees killed by reduced watering and drought and the replacement trees you have planted that will need water. Tell them how usage has changed after turf became weedy. Ask that a long-term plan be developed. Council heard a report on the ranger program on April 17. PRNS is switching to central dispatch instead of fixed post. There are more classifications: Top Dog, Asst. Top Dog, 4 supervisors, senior rangers, entry level. This ladder plus better salaries attracted more applicants and there are only a few vacancies. Now they are wondering whether rangers should be armed. Multiple letters were received from current and former rangers and loved ones as well as members of national park association. They told stories of scary encounters in SJ and elsewhere. Councilmembers discussed the idea of moving rangers to police department. No report mentioned that there used to be a POLICE PARK PATROL in addition to rangers. A six month study is underway with PRNS, SJPD, SJFire, Water District, Housing, Fish and Game, CA Water Board, Environmental Department. The interdisciplinary task force appears to be designed to deal with the waterways/rivers and illegal activities in the creek beds and not problems in the neighborhoods. The task force plans to consult with Creek Clean-up groups, but do not plan to speak with neighborhood or regional park groups or users even though there are criminal incidents and user conflicts in those parks. Conducting an examination of whether the Park Ranger Program would fit existing community needs more efficiently by being placed under the supervision of the Police Department. There will be FIVE meetings in the neighborhoods after the draft budget is released May 1. Then all of the departments will present to council during daytime hearings. Mayor’s budget comes out June 1. 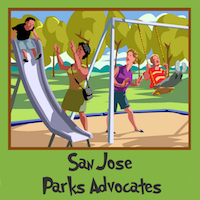 Go to the community budget meetings and talk about PARKS. Water. The importance of parks in daily public life of the community. Tell your park story. Wednesday May 23 at Seven Trees Community Center 3590 Cas Dr.
PRNS took over most of the HR tasks and was able to fill 40+ open positions in fall 2017. They continue to replace workers as they leave, get promoted, or go on leave. Since PRNS is no longer dependent on HR staffing to fill the jobs, maintenance should improve. There are NINE new positions approved in June 2017. Park conditions were assessed in July and August 2017, so this year’s report does not reflect the increased staffing. For this reason, the department did not ask for more workers this year. Park conditions will be assessed again in Summer 2018. Council asked staff to prepare a list of projects for a possible bond measure. The Mayor wants to projects to save money. Among other ideas, PRNS is proposing smart irrigation controllers that are linked together so that they can be handled all at once without travelling to each site to change watering schedules for the season. WATER is key to beautiful parks. Please write.